NEW YORK -- Vin Scully says the last ballgame he will broadcast is the Los Angeles Dodgers' regular-season finale in San Francisco - regardless of whether they reach the playoffs. The 88-year-old announcer told the Los Angeles Times his Hall of Fame career will end Oct. 2 at AT&T Park, where the Giants will host the Dodgers in the last game of the regular season. Scully had already said this will be his final season in the booth after 67 years, but until Tuesday had not announced whether he planned to call any potential postseason games on radio. His decision was not a surprise to the team, Dodgers spokesman Joe Jareck says. 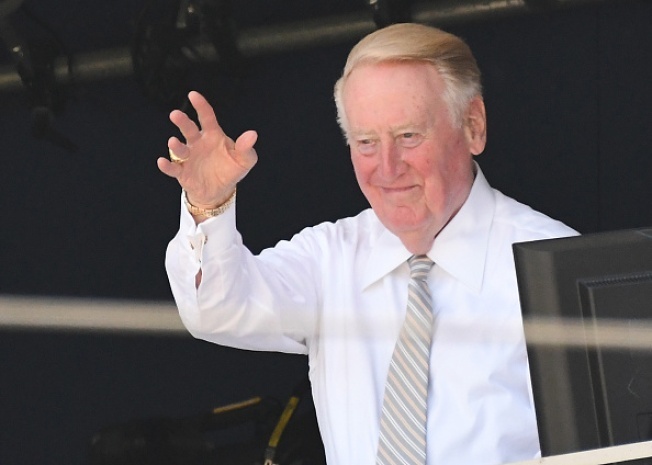 Scully has two farewells coming up: First, on Sept. 25 during the Dodgers' final home game of the regular season and then a week later at San Francisco. Looking for their first World Series appearance since winning the 1988 championship, the Dodgers began the night with a four-game lead in the NL West over the Giants. Scully switched from television to radio in recent years during the playoffs, when national broadcasters have exclusive TV rights. "I'm going to say goodbye at Dodger Stadium the last game with Colorado. I will say goodbye in San Francisco. And then that will be it," he told The Times.